Bill of Lading: Learn what it is and how to use it. What is a Bill of Lading? It is arguably the most important document when it comes to shipping. Not only is a Bill of Lading or (B/L) a legal document for carriage of goods, it is also the only document that can be used to prove goods were received in good order by the appropriate person. ShipCanada's dispatch system automatically generates bills of lading for your convenience, however, it is always the responsibility of the shipper to verify the information contained within the bill of lading before loading a truck. Specifically, shippers should verifiy quantities, dimensions, weight, addresses and valuations. Declared value of the product. Evidence of BOL usage goes back to Roman Times, however, to illustrate its origins imagine being a tobacco farmer in the 1700’s in virginia and receiving an order to ship a truckload of your product to New York. After sourcing a carrier (likely a horse & buggy) to haul your product, you would have to consider how you were to be paid for that shipment and how to prevent the carrier from disappearing into the night with your valuable product. The first thing you would do is make a contract with carrier outlining the transportation agreement. Next, to ensure that the same amount of tobacco that left your plantation arrived to the customer; you and the carrier would have to agree on the weight of the product by affixing your signatures to the details within the Bill of Lading once loaded. Now, back in those days, the bill of lading would also be used to pass “title” or ownership of the product so the carrier would also use the document this to ensure that he would be paid properly for completing such a long journey by the responsible party. To achieve this, every bill of lading had (and stills has) the payment provisions for the freight cost “Prepaid” & “Collect”. If the cost of the freight was being paid by the shipper the marking “prepaid” would be used. If the cost of the freight was to be paid by the receiver the term “collect” would be used. “Collect” can also be used when the carrier is to collect the not only the freight charges but the price paid for the cargo as well. It is also very common in modern times to see the term “Third Party Billing” used in place of “pre-paid” or “collect” when the carrier is to be paid by an intermediary such as a freight broker. 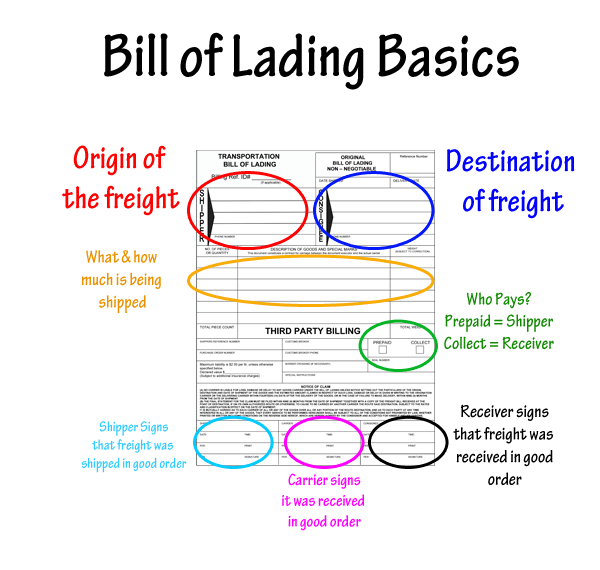 Below is a diagram showing the most basic elements which must be present on a standard bill of lading.